receiving the Regulatory Champion of the Year award. RENEW Wisconsin has been honored as the 2016 “Regulatory Champion of the Year” by the Interstate Renewable Energy Council (IREC), a national organization working on the advancement of clean energy. 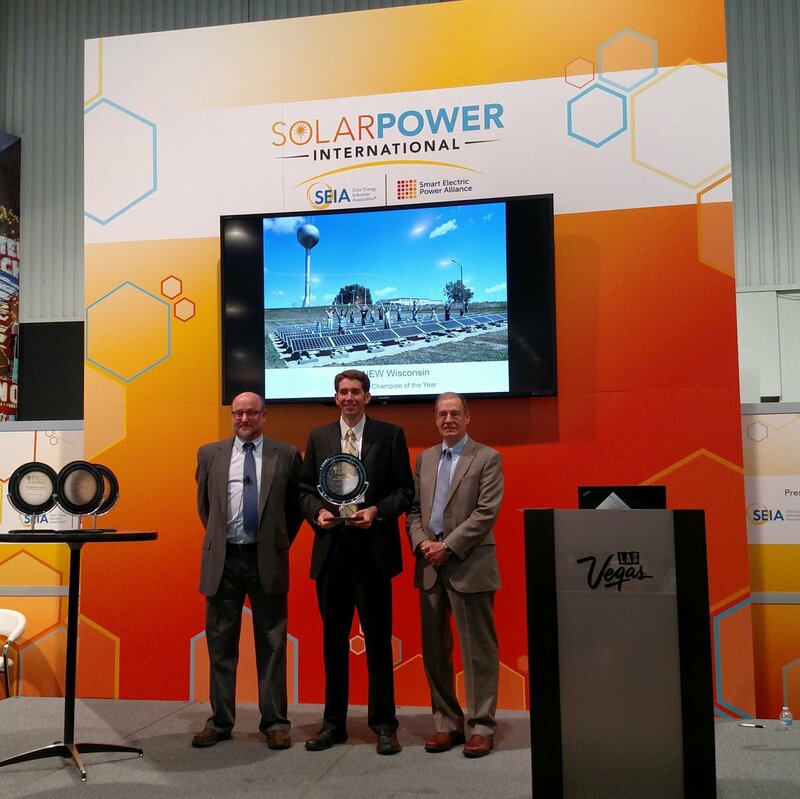 The award was given at the annual Solar Power International conference in Las Vegas on Tuesday night. RENEW won this people’s choice award for leading the campaign to overturn a proposal by We Energies, Wisconsin’s largest electric utility, to charge extra fees to customers who generate power for their own use from sources such as solar panels. These so-called “connection fees” would have amounted to approximately $20 per month for a typical residential solar customer, and thousands of dollars per month for dairy farmers who generate electricity from cow manure. After the Public Service Commission of Wisconsin (PSCW) approved We Energies’ unprecedented proposal in November 2014, RENEW Wisconsin partnered with The Alliance for Solar Choice, a national solar advocacy organization, to challenge the PSCW’s decision in Dane County Circuit Court. In October 2015, Judge Peter Anderson ruled that there was not sufficient evidence in the regulatory proceeding to justify the agency’s decision allowing We Energies to impose additional fees on that subset of customers who produce power for their own use, giving RENEW Wisconsin and TASC the legal victory. IREC’s 2016 3iAwards honor innovation, ingenuity, and inspiration from the nation’s best in both renewable energy and energy efficiency. This year, over 1,000 people voted for the finalists in the People’s Choice awards, which was “an impressively distinguished group of meritorious projects and acclaimed people” according to IREC’s website. “Not only does renewable energy help citizens and businesses save money on their energy bills, it also drives economic expansion and creates family-supporting jobs. The solar industry alone now has over 200,000 employees nationally. Our legal victory protects the ability of citizens and businesses to use the sunshine striking their rooftops to reduce their electricity bills, and fuels growth in Wisconsin’s solar and renewable energy markets. We are honored to receive this recognition from an esteemed national organization and based on the popular support of our members and experts within our field,” said Tyler Huebner, RENEW Wisconsin’s Executive Director. See all the IREC 3iAward winners here.